Study of the hydrographic network of the Kronospan plant site. January 2018. 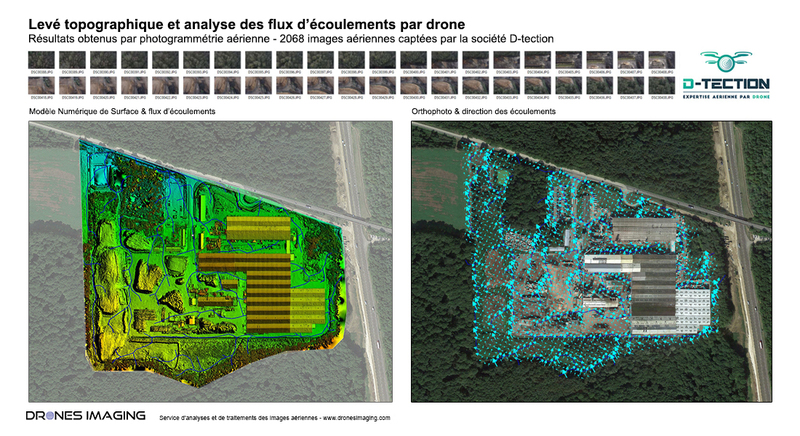 Results obtained from 2068 aerial images taken by D-Tection, company specialized in aerial inspections by drones. Following a fire at its production site, the company Kronospan, specialized in the manufacture of plywoods made contact with the companies D-tection et Drones Imaging to model the entire right-of-way of the plant and thus analyze, through numerical simulations, the multiple paths of water discharged by firefighters during the fight against fire. Thanks to the Photoscan software, the 2068 aerial photographs captured by the D-Tection company were used to 3D modeling the entire site allowing a faithful representation of the terrain: DSM (Digital Surface Model). The DSM thus generated (whith 1cm spatial accuracy) has made it possible to simulate the waters flows discharged by civil security during the fire, to analyze their direction to ultimately locate: the dispersal zones in the nature, where pollutants related to the activity of the factory have been transported. Following this dispersal of pollutants and on the order of the DREAL (Regional Directorate for the Environment, Planning and Housing), the Kronospan site will soon begin the upgrading of its storage platform by realizing new watersheds for rainwater harvesting. Thus, the MNS generated for the simulations will also be used for the topographic study and the dimensioning of the future retention ponds (dimensioning of the surfaces and depths). Seduced by the speed and accuracy of the results obtained, the rescue services also showed a keen interest in this new use case allowing to locate potential areas of pollution following disasters or accidents with loss of fluids. Source : D-Tection company .